I have not ever read a novel by Allison Winn Scotch (follow the link to read a couple of Dawn’s reviews of her earlier novels), but I have always wanted to check her out. The premise of her newest novel In Twenty Years intrigued me. On the night before they graduate, Bea gathers her five closest friends for a goodbye ritual. She hands out pen and paper and tells Catherine, Owen, Annie, Lindy and Colin to each write a letter to themselves about where they hope to be in twenty years. The plan is that they will all get together at their college reunion and read the letters together. Bea was the one who kept the group together. Unlike some of the others, she was not too mean or too self-absorbed or too cavalier. She walked a little on the wild side, and in the end, that probably led to her untimely death, less than 10 years after they graduated. Her funeral is the last time they all saw each other. They were a six-point star and never thought they’d go their separate ways. But after a couple of incidents at Catherine and Owen’s wedding a year or so before the funeral, many of them have stopped talking. Along with the return of the friends come old grudges, unrequited feelings, and buried secrets. Catherine, the CEO of a domestic empire, and Owen, a stay-at-home dad, were picture-perfect college sweethearts—but now teeter on the brink of disaster. Lindy, a well-known musician, is pushing middle age in an industry that’s all about youth and slowly self-destructing as she grapples with her own identity. Behind his smile, handsome plastic surgeon Colin harbors the heartbreaking truth about his own history with Bea. And Annie carefully curates her life on Instagram and Facebook, keeping up appearances so she doesn’t have to face the truth about her own empty reality. A twenty-year reunion naturally gives one the opportunity to reflect upon one’s goals and aspirations, especially in this case when actually faced with their own words from their youth. All of these characters take a second look at their lives and finally feel the loss of their friendships. Check out the TLC Book Tours page for more info. 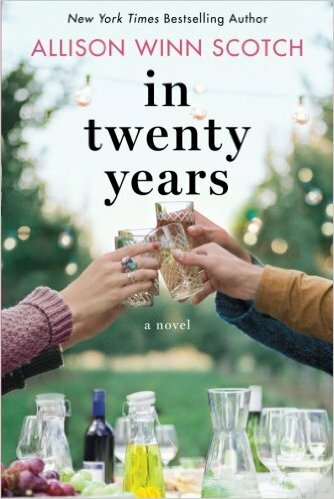 I attended my own 20 year high school reunion last summer – what better time to read this book than now? !